So on Monday, about lunchtime, my sister sent me a link to the awesome Diana Eng's supercool . I desperately needed a costume for my son's school Halloween party THAT SAME NIGHT, so I went ahead and put one together … with a few modifications for the lazy. After trying it on to gauge proper placement, I stapled the bowls to the front of the box with an ordinary Swingline stapler (not a ). I used a stapler because I'm sure I have a glue gun around here somewhere, but bless me if I can find it. I asked my son to bring me a real Lego block for reference, grabbed a Sharpie, and wrote LEGO on all the bowls. 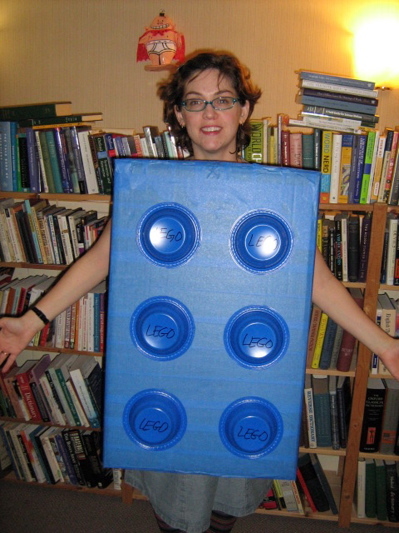 The whole costume, not counting driving to the store or the time it took me to move some bikes in the garage so I could get to the right-size box, was done in about twenty minutes. Sweet! No sewing required, even! Thanks very much to Kate for the link and to Diana (and the folks at CRAFT) for the idea! And in unrelated news, if you want to see me wearing the , there's a picture up . Amanda at the Etsy store is making these dress-patterned-themed cards and offering them to people who buy patterns from her shop (and use the code "Dressaday" when doing so). Getting sweet handmade bonuses like this is one of my favorite things about buying from Etsy shops or on Ebay or from small websites. I love it when the packing slip is an old postcard, or a piece of construction paper rubber-stamped with the name of the store, or a cut-up magazine page, and not something printed from a laser printer straight out of Microsoft Office's "Invoice" template. If you're looking for something to buy to get the card, may I suggest this? Isn't this the dress the über-competent 1950s mom would wear? I think so … casual, yet trim and neat, and with that lovely collar. It would make a great summer office dress in pique — cool for the street, but easy to throw a cardigan over in the Land of Air-Conditioning. And when someone wearing this calls your full name (first, last AND middle) out across the neighborhood, you know she means business. Was That 1996, or 1997? 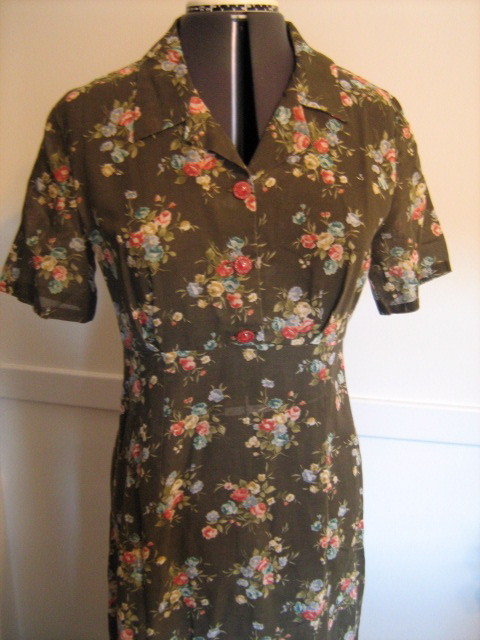 This is a floral voile dress I'm pretty sure I made in the summer of 1996 or possibly 1997. I made it to wear to the wedding of a friend — he's Orthodox, so the dress originally had long sleeves, and I trimmed a cream straw hat with a pink flower and brown ribbon to wear with it. (Although I cut off the sleeves after the wedding, I left the skirt very long — nearly ankle length.) I suppose I could just email and ASK "Hey, when did you guys get married?" but that would take all the fun out of trying to place the date from memory. I think I bought this fabric at Vogue Fabrics here in Chicago, and the buttons at a much-missed vintage button shop that used to exist on Armitage, near Halsted. The pattern is, I'm fairly sure, either a New Look or a Style pattern, and if you're desperate, I could probably dig up the number without too much trouble. I know I made this dress at least twice — the other time in a white-and-yellow daisy print quilting cotton with large green-and-white dotted dome-shaped plastic buttons. I still have the daisy dress, too … I found both of these while trying to switch my closet from summer to winter. If you're ever called upon to date any Erin creations, you should recognize that this is firmly in my middle period: the early period (jr high/high school) was nearly exclusively cotton dresses with kimono-sleeved minimally-darted boatneck bodices attached to full gathered skirts, with inseam pockets and little, if any, waist shaping, often in shades of blue and green, and A-line long skirts with a zipper and attached waistband. I think I occasionally indulged in the heady thrills of the McCalls NYNY patterns, but not often. The middle period (of which this is a prime example) involved trying to find retro-ish current patterns to make with vintage-y details (thus the glass buttons here). 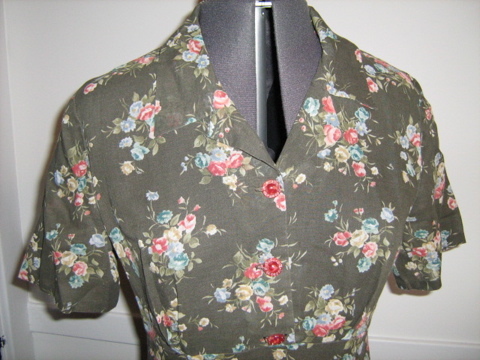 Late middle period involved my first forays into vintage patterns (such as the ). One of the quirks and/or hallmarks of middle-period Erin sewing is an abundance of collars — and making the collar in this voile was very tricky. It's so thin (and yes I wore it with a full-coverage slip that could have been a dress all by its lonesome) that the seam allowances looked far too bulky on the first go-round. I think I ended up doing three rows of very tiny machine stitches, very close together, and cutting the allowances off at the outermost row. There was probably a better way to do it, but I was also, I'm sure, pressed for time. Late-period Erin … well, I think you can all identify late-period Erin at this point. I firmly intend for my 'late period' to last about forty more years (if I'm lucky). I'm getting slammed with stupid pharmacy comment spam (would anyone buying your possibly-contaminated drugs from scummy web pages stop please right now? You only encourage them!) so I've turned on the captcha for a day or so until they go pick on someone else. I'm sorry to inconvenience you all, but it's hideously boring to go and delete all the spammy comments! With any luck I can turn it off in a few days. Thanks for understanding. Many thanks to Susan, who sent me this link from . The tulip version is pretty too, but how much better would it be if they were little alligator heads, opening their jaws to swallow your stuff? Or bird beaks? Or something else a little less pretty-pretty? Maybe flames, engulfing the pocket contents? There are lots of ways to have fun with something like this. Who says cutesy appliqué is reserved for the under-ten set? SoVintage has this listed as $38 (!) … click on the image if you must have it. Not only does this pattern description (from ) use one of my favorite words (plastron, 'an ornamental front of a woman's bodice or shirt') but it also seems to be a dress that just cries out for multiple iterations. Whenever I buy a new pattern (or merely think of buying a new pattern) I sit down (metaphorically) and try to work through all the different ways I'd like to make it. As you can see, I like to work from the conventional to the un-. But if I find that I can only see a pattern ONE way, I try not to buy it. Why limit yourself? The post office has delivered some fun books lately for me to share with you — I love getting review copies, especially of novels, because then reading for fun magically becomes Work with a capital W. As in, "Honey, I'd love to put away the laundry right now, but I really have to finish this book for Work. You understand, don't you?" Of course, my husband twigged to this little ruse years ago, so there's some eye-rolling involved (and if I'm eating chocolate while "Working" all bets are off) but still. It's fun. One of the books that was sent to me was this one, , which I suppose is technically YA, although it certainly has what we used to call Adult Content. All I know is that if I had come across this when I was thirteen, I would have read it three times, and even as an adult, it was truly entertaining. The people are whole and well-rounded and I liked Violet very much, as the ugly duckling who turns out to be a swan (and who might be happier as a duckling). It was so nice to read a fashion-y book that didn't go overboard with the brand names, didn't seem like an extended game of paper dolls, and which featured people you could like and understand. 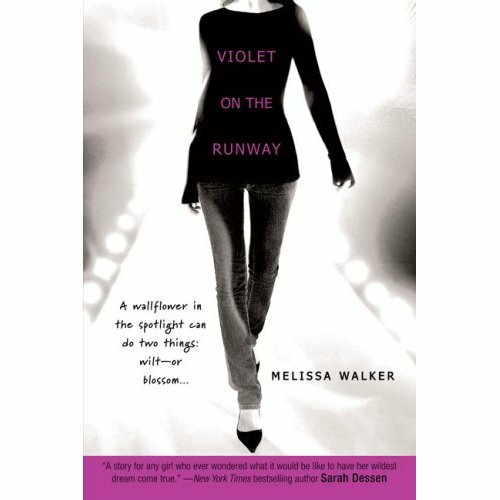 An excellent book for your favorite fashion-mad teen (and if you're careful and don't get chocolate on the pages, you can read it yourself first). Lastly, this is probably better suited for my , but is just an adorable book, and I'm so glad that Walker has brought it back in print. Gelett Burgess was, in fact, the guy who coined the word blurb, which makes me insanely happy, in a meta kind of way, that I was able to blurb this book. (Not many people get to blurb the blurber.) Burgess Unabridged is a collection of his other neologisms, none of which ever had the success of blurb, but which make for interesting reading, nonetheless. Like the word kipe, which he defines as "A woman's glance at another woman." Leaving aside the heteronormativity of that for the moment, doesn't that word describe every you've ever seen? Or his word gorgule, meaning "elaborate bad taste," something we always know when we see it — and now have a handy word for. Burgess Unabridged is illustrated, too, by Herb Roth, in a kind of Aubrey Beardsley-meets-Gahan-Wilson style. There. A little light reading for a Wednesday?